As an enthusiast developer, I write and read a lot of code every single day without exception. However, not always you can take your laptop and work wherever you want for different reasons. Nowadays, everybody has a Smartphone that is small as a hand. Many developers say that that's already an impediment because you can't work comfortably, but we do not all think in the same way (i mean, not all of us have huge fingers). In this top, we will share with you a collection of 7 from the best free code editors applications available for the Android Platform. If you want to enjoy your development experience while you work with any of the apps in this top, we recommend you to use an appropriate keyboard like Hacker's keyboard. This keyboard is available on the Play Store. Dcoder is a mobile coding IDE especially designed to hone your coding skills on mobile. It is a complete package to learn and comprehend the programming languages from a wide range e.g from C to Ruby. It includes Rich text editor supporting syntax highlight and packed with all the necessary tools required to give you all the edge an IDE or Code Compiler can give. The compile process is made through cloud APIs, that means that these features aren't available without internet. Not only you can code, you can debug the code to see compilation errors and Result on the same screen. Its more alike port of your favourite Code Editors like Notepad++ or Sublime Text with compilation power. It offers Custom Themes too, Editable font Size for the Editor and much more. This app offers in-app purchases. Quoda is a sophisticated and easy to use source code editor or IDE, much like Notepad++, Textmate or Sublime Text, with integrated support for SFTP/FTP(S) servers and cloud storage (Dropbox and Google Drive). Other features include downloading URL source code, Code-completion, auto-encoding detection, brace matching, auto-indentation, line bookmarking, colour picker, HTML formatting, and even more - many of these unmatched by other Android IDEs or text editors. If you want to code productively away from your PC, Quoda is a must have, allowing you to carry a text editor and IDE like Notepad++, Textmate or Sublime Text in your pocket to code when on the move. QuickEdit is a fast, stable and full featured text editor for Android devices. It has been optimized for both phone and tablet, it's of high performance and real time feedback on large text files (more than 10,000 lines). The speed and responsiveness is very good if you compare it with other text editor apps on Google Play. It can be used as a text editor or code editor for normal text files and programming files. It will automatically detect the character encoding of your files, but you can still change it as you wish. With anWriter you will significantly increase your coding speed, compared with a usual notepad. anWriter is much lighter than most IDE, but at the same time much more powerful, than most of notepad like editors. 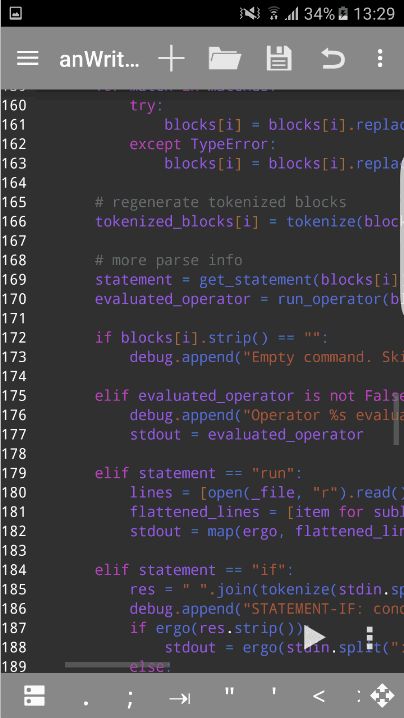 Our Code Editor Free is an integrated development environment (IDE),text editor, code editor for Android. 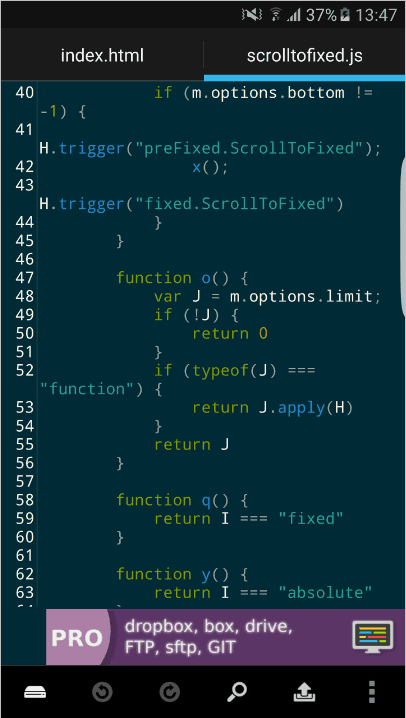 Our Code Editor offers many features to enhance your performance while you work. Download and edit files from many sources (sftp,dropbox), an useful autocomplete and many highlight themes. Ideal for tablets, cell phone and other android devices. No account or internet connection required (excluding dropbox and SFTP), just download, install run and start coding ! The code files will be managed locally on your device. Although this app is closed-source, it is totally free and it doesn't have ads. 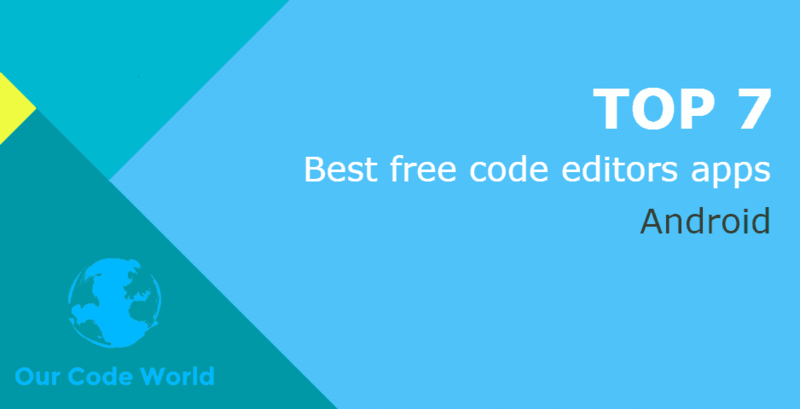 Our Code Editor Free was written by Our Code World . 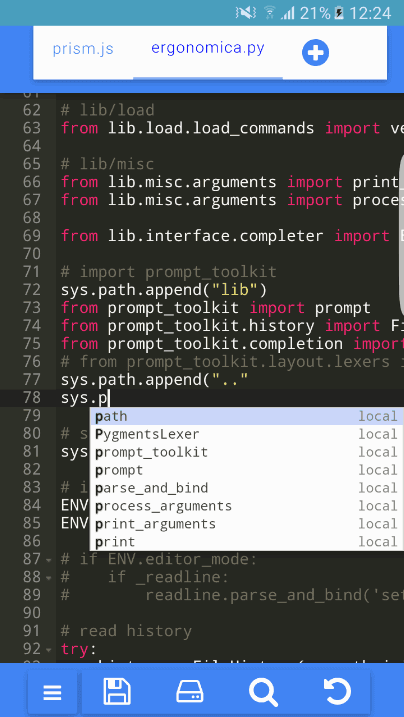 Simple, Powerful and Open Source Text Editor for Android. Built following the latest Android Guidelines to make the experience the most intuitive on the Phone but also on Tablets. 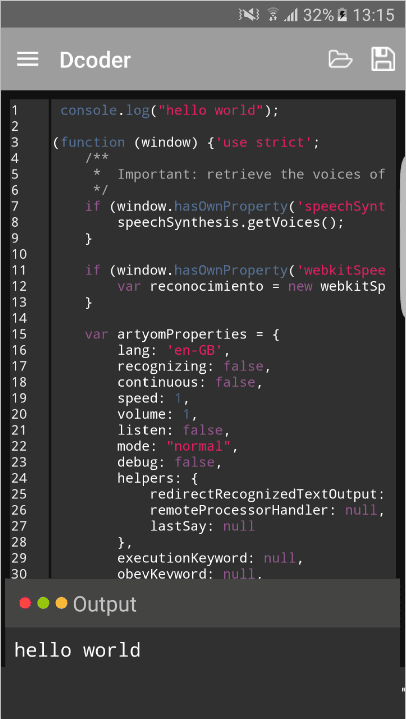 DroidEdit is a text and source code editor (similar to Notepad++ or gedit) for android tablets and phones. Take your work everywhere with this application, code while you're waiting for the bus or when you're relaxing in a nice beach (i don't know why someone would code on vacations but, whatever). Don't rush to your office if you receive an emergency call asking you to change some code. Just pick your mobile phone and edit everything you need. This app supports Emmet Tools, expand simple expressions into full fledged HTML code automagically. The ad supported version has exactly the same functionality as the paid version except it doesn't have SFTP support, Dropbox support, Custom themes and root mode. These are some applications that although they aren't listed in the top, they deserve to be mentioned as they still rock ! 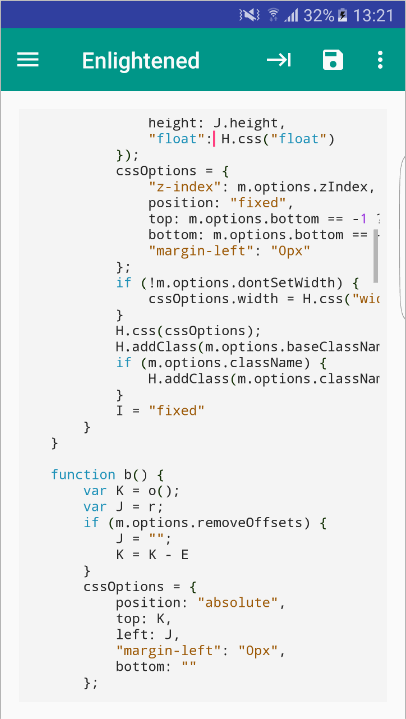 Codeanywhere is a text, code and markup editor, that has been redesigned and reengineered to be light, fast, and mobile-friendly. Connect to your FTP, SFTP Servers, Dropbox or Github account and easily manipulate your resources, folders or files just with the swipe of your finger. Share and collaborate on projects or just a single file - from wherever you are, and of course quickly edit code with our keyboard that has been customised for developers on the go. Codeanywhere also works on the desktop (Mac and PC). 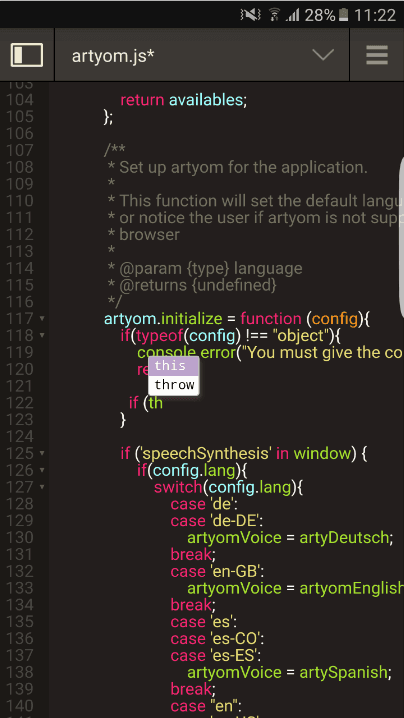 Apparently the Codeanywhere app doesn't allow to edit local files from your device, only from remote sources. 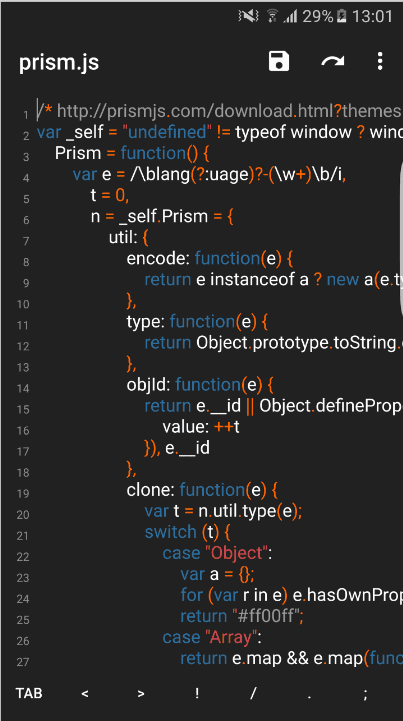 Enlightened is an elegant, minimalist code editor for Android. 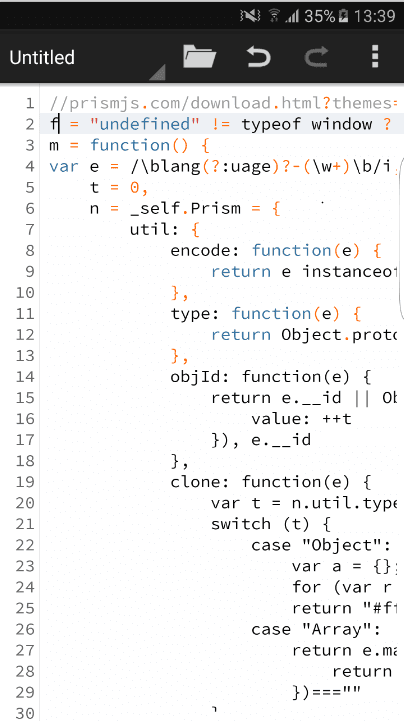 Its purpose is similar to that of other lightweight code editors: it allows you to edit text and code of many different languages. Think of it as a kind of Notepad++ for Android devices. At the same time, its goal is to stay minimalistic and intuitive. It has absolutely no ads, intrusive permissions, or other nonsense. This app is not stable and have some bugs, however the app has potential and its improvable, that's why it's worth to mention it. 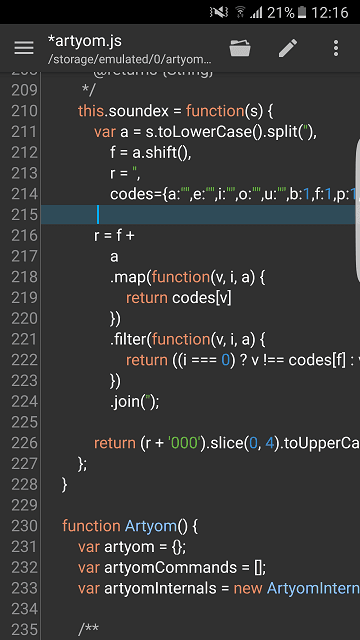 If you know another awesome free code editor application, please share it with the community in the comment box.